Students who take rigorous courses in high school do better in college and graduate at a higher rate than students who take less demanding classes, according to a report released by the Maryland Higher Education Commission. Students who take at least four years of English, three years of mathematics, three years of social science or history, two years of natural science, and two years of foreign language are less likely to need remedial help in college. These students are also more likely to earn better grades in their initial English and math courses and have higher first-year grade point averages in college. These are the conclusions from the Student Outcomes and Achievement Report (SOAR), which assessed the success of Maryland high school graduates during their freshman year at Maryland colleges and universities. The most recent report, released by the Commission on November 29, 2001, examines the performance of students who graduated from state high schools in 1999 and enrolled in a Maryland college during the 1999-2000 academic year. Commenting on the report, Maryland Secretary of Higher Education Karen Johnson stated that "the message is loud and clear: students must be told that if they want to do well in college, they must take courses in high school that will prepare them for success." State Superintendent of Schools Nancy Grasmick said that "high school programs will prepare students to meet college standards only if coursework is on target with college expectations. Ultimately, a pattern of rigorous course-taking in high school is absolutely critical to the success of every student." For the sixth consecutive year, students taking college preparatory classes performed better than their counterparts on every measure of college achievement. With few exceptions, this was true regardless of the student's race or gender, or where they attended high school, or what college they attended. SOAR was first published by the Commission in 1993 to provide high schools and school districts with feedback on the academic success of their graduates. 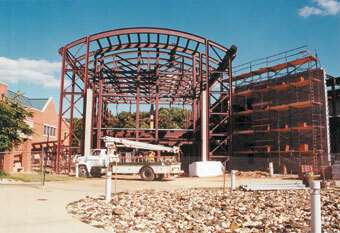 Construction continues on the college's Fine and Performing Arts Center, scheduled to open in fall 2002. The photos in this issue were taken during the summer of 2001. This building will house the college theatre and art gallery, as well as a Business Training Center. Dedication of this facility, along with the new Life Fitness Building, will take place October 4, 2002.